The Grand Parade of the 20th Century, now playing at Arena Stage, is an imaginative, creative and highly theatrical performance art piece. The premise of the performance is to display the procession in America of historical events of the 1900s. This is achieved through movement and music, as well as feats of acrobatics, on wires, elastic cords and suspended from geometric hanging frames. 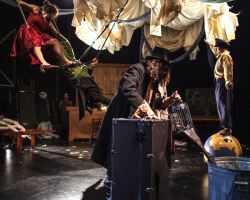 As the “times change,” the actors present vignettes of well-known historical events through rapid change of costume and construction of set pieces from tables and stretchers. Throughout the performance, it was of great help to the audience that the designers provided a projector which displayed familiar videos and newspaper clippings of the time periods being represented, without which it would have been more difficult to follow. 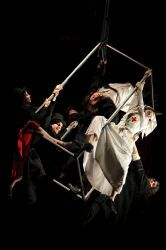 Movement was both erratic and frenetic, with actors representing nurses, soldiers, housewives and businessmen all jumping into bungee harnesses at seeming random to bounce around the space. Conversely, they were equally likely to be seen climbing into giant metal geometric frames to swing and spin, then “die” for undisclosed reasons. While the movement was crisp and obviously planned out well, the result was that the actors never chose to telegraph the reason behind these movements, so no emotion was conveyed. The actors did, however, do very well at keeping their energy consistent and visually interesting. Their unflagging passion for the piece showed through every aspect of their performances. Their efforts were obvious in bringing forth their version of performance art, and their commitment commendable. Each character at some point or another carried out their role in the scenes of Prohibition, World War I and II, Vietnam protests etc. while wearing an animal mask (dog, rooster, pig, horse) made of papier-mâché. There was no reason specifically communicated during the action of the piece for these masks–one might expect the actor donning the mask to change his body movement to match the head, for example, but that did not occur. However, the program notes stated that the entirety of the visual designs were drawn from inspiration of a cubist painter, Marc Chagall, who often paired human beings with animal headed beings in his paintings. This proved problematic, as not all audiences might be familiar with his work, and it seemed every aspect of the show was informed by his inspiring paintings. Also, the program made it very clear that the artistic vision was to present a story of American history in the 20th century, but every aspect of the design was informed by Russian art (including the Russian composer). Somehow the American point of view was often obscured and lost. One very memorable and well-acted vignette focused so intensely on showing the journey of the Russian Space Program launching dogs into space, that the lunar landing by Americans performed later seemed completely overshadowed and insignificant. Overall, despite some inspiring orchestration and well-timed physical stunts, the performance lacked an emotional bridge for the audience to connect with, although this may have been intentional. When actors “died” en masse during fight scenes, the emotional connecting point was lost, as no personal human stories were conveyed. A scene of a housewife cooking eggs on a hot plate from the 50s had no emotion; it played out as a stereotype in living marionettes. 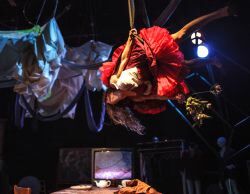 The scenes were pop history told on circus equipment, and unless one had lived through the events being played out, no deeper meaning could be squeezed from the show with which to show the impact history has on a country. Ultimately, it is not always “innovative” to produce a performance with which an audience cannot emotionally engage, especially when considering the venue of a theater. Oftentimes a collaborative show can suffer from too much concept and not enough character. An artistic presentation does not have to be linear or logical–however, it does need to connect with the audience in some way, otherwise it is pure spectacle. If a visually dazzling spectacle was what was intended to be portrayed by this troupe’s work, then they succeeded. This article can be linked to as: http://showbizradio.com/go/9129.